Our youth program emphasizes the importance of being a good person, first and foremost, then a good student and then a good lacrosse player. Commitment to family and school come before the commitment to lacrosse. Our players are taught to be respectful to their coaches and teammates. They will conduct themselves in a respectful manner at all times and especially when representing our league at games or other functions. Our parents are expected to conduct themselves with restraint on the sidelines and to cheer in a positive manner. SNYL is a developmental league and the expectation is for each player to have the opportunity to improve his or her lacrosse skills during the course of the season. SNYL will instill the ideals of good sportsmanship and provide an enjoyable program that develops the fundamental skills, leadership, self-discipline and team play associated with lacrosse. 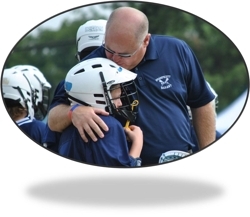 Swampscott Nahant Youth Lacrosse competes with our peers from other communities and encourages friendships and associations with our counterparts that could last a lifetime. There are no standings kept, and no league championships or playoffs. We field all players as equally as possible with the goal of teaching the sport and providing a fun experience for all involved. We are determined to provide kids with an outlet that has not been swept up in the pressure filled, win-at-all-cost mania conspicuous in sports today.